Are you in over your head trying to plan a scientific workshop, conference or training? Lacking in administrative or technical support? Confused by the federal agency rules and regulations? Call (1-303-497-8666), email CPAESS, or use the contact form and let us know how we can help. 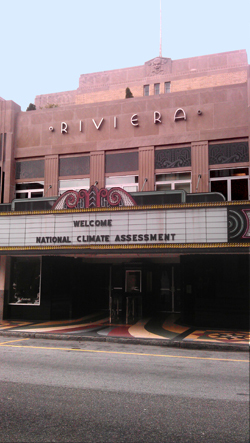 The Riviera Theatre in Charleston, SC, was the location for the National Climate Assessment Meeting, 2012. Plan to include CPAESS as part of your organizing committee from the start so we may help develop your budget and create a task timeline that will keep your event on track. CPAESS has organized all kinds of scientific events in locations all over the world. CPAESS has longstanding relationships with several site search and venue procurement agents who provide assistance locating available venues. CPAESS has extensive experience pulling together events using U.S. federal agency funding as well as funds from international governmental science agencies, NGOs, and private corporation sponsors. CPAESS/UCAR has a contract with Regonline/Active Network to take care of your registration, name badge and abstract needs. We also develop custom registraton and abstract collection systems as required, with the capability of producing online agendas and poster galleries. Registration fee funds collected can be used to pay for your event. CPAESS owns top of the line laptops, LCD projectors, Polycom phone, portable color printers and we know how to use them. These items are available to you free of charge when you use our staff for onsite support. CPAESS has a full time IT professional on staff and we have experience with conference recording, webcasting and other types of multi-media interactions. CPAESS has a full time web/graphic designer on staff to create event web pages. See past event webpages. CPAESS staff have provided on-site support for hundreds of meetings and events all over the world. Our staff on site means that you can focus on the science while we take care of everything else.